Duck tortellini with pistachio and kale from Fico (photo: Oskar Rossi). With a handful of strong new players arriving on the Hobart scene to mix things up and champion all things Tasmanian, there’s never been a better time to eat and drink your way around Australia’s southernmost capital. It’s a no-brainer that Hobart’s eating and drinking should be so good; there are few other places in Australia with such an onslaught of insanely fresh, super seasonal, hyper local everything on its doorstep. Forget food miles; from whiskey to wagyu, saffron to sparkling wine, it’s all made here – and ridiculously well, too. While the pace of life elsewhere on the Apple Isle might (mercifully) still be as sleepy as it’s ever been, the Hobart bar and dining scene has majorly kicked things up a gear in recent times. Gone are the days when “Slowbart” only had a sprinkling of decent places to eat, today you’ll be struggling to tick off your culinary to-do list in just one weekend. So, organise your flights and get ready to savour the good stuff. Hobart will be sure to have you dreaming of open fires, harbour views, briny oysters and cosy whiskey bars until you next return. Atmospheric newcomer Dier Makr (run by Melbourne expats Kobi Ruzicka and Sarah Fitzsimmons) is winning fans for its serious cocktails, low-intervention wine list, and boundary-pushing, produce-driven seasonal tasting menu. The vintage tunes and lo-fi fit-out win points too. Another welcome new addition is Fico, the likable Italian-accented bistro headed up by ex-Vue de Monde chef Oskar Rossi and his Italian partner Frederica Andrisani. You’ll find exemplary pasta and contemporary takes on old Italian ideas, with outstanding Tassie produce starring at every turn. The sleek interiors at Fico. (photo: Oskar Rossi). Also new this year is Rodney Dunn’s The Agrarian Kitchen Eatery & Store, a short drive out of town in New Norfolk. Allowing his lovingly-raised produce to speak for itself, simplicity rules here. Everything is done in-house, from growing to curing, fermenting and smoking, which means you’ll get a true taste of Tassie terroir. Established player, Franklin, recently said adieu to founding chef, David Moyle, welcoming ex-Bar Brosé (Darlinghurst) chef, Analiese Gregory, who’s brought some of her hometown signatures along for the ride. Sit by the open kitchen, order a glass of local fizz and some Angasi oysters and let the savvy staff guide you through. Fancy a Latin American meat fix? Say hola to buzzy waterside hotspot Frank, where you can snack on pork and chipotle empanadas or fresh Tassie oysters topped with chorizo and salsa dressing before moving onto a charry skirt steak from the charcoal grill. A little further along Franklin Wharf you’ll find Aloft, a minimal and sophisticated attic space where local produce gets a deft mod-Asian touch. Equally suited for drinks and snacks as it is for a long slow dinner, Aloft’s uninterrupted harbour-side views offer a fine excuse to switch your operating speed to ‘slow’. Carb lovers always know to detour past Pigeon Hole for a fix. This quaint and homely fave does solid coffee, wholesome comfort food and delicious pastries. A selection of treats on offer at Queens Pastry (photo: Catherine Peacock). If it’s cold, order the porridge, and always get a pastry to go. At fresh-faced newbie Born in Brunswick you can forget the fatty fry-up; here you’ll brunch on the likes of koji marinated pork shoulder with soba noodles and a ginger shiitake broth, or house-smoked Huon salmon with black sesame and Tasmanian wasabi. Up on the hill in NoHo (North Hobart), Alastair Wise’s Sweet Envy is like all your sugar-laced childhood fantasies made a reality. Wise, a classically trained pastry chef, churns out next-level cookies, cake, ice-cream and pies. Our tip? Don’t get paralysed by choice, just order more (you can always eat it on the flight home). Similarly sweet-toothed newcomer Queens Pastry keeps the brief tight: just pastries and specialty coffee. A pecan maple scroll from Queens Pastry (photo: Catherine Peacock). If its Instagram pics aren’t reason enough to get you there, you should probably check your pulse. And when all that sugar is making your teeth ache, there’s Straight Up Coffee and Food, where #cleaneats are the order of the day. Think miso marinated pumpkin with cauliflower ‘couscous’ and tahini yoghurt along with house-roasted coffee and fresh juices. The Story Bar at the stunning new MACq 01 Hotel has brought a new level of glitz and glam to the local bar scene. Grab a fireside posse, order some Tassie sparkling and allow your spirit to be soothed by the twinkling lights on the water. In winter, when bracing gales are whipping off the top of snow-capped Mount Wellington, cosy old fave, the Cellar Door at Lark Distillery makes for a fitting refuge. With over 150 single malts on offer, you’ll be toasty in no time. Macq01 is Hobart’s hottest new hotel with a chic restaurant and bar to match (photo: Adam Gibson). For more killer waterside views, The Glass House, set on Sullivan’s Cove makes a superb perch for pre-dinner cocktails or a deep immersion into Tasmanian wine and spirits. 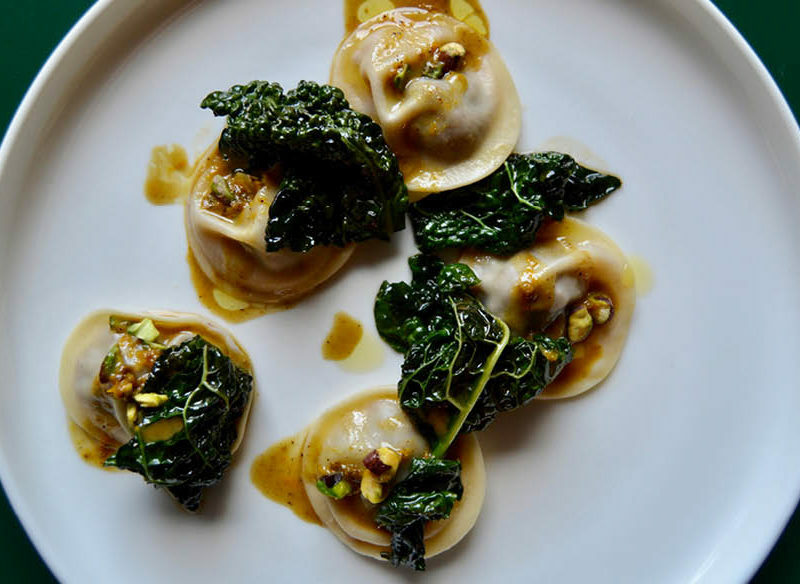 A worthy nominee for both eating and drinking, Euro-accented wine bar and bistro, Ettie’s sports the kind of effortless elegance and confident charm that you might expect from an industry stalwart, not a freshly opened newcomer. Go for the epic wine list, stay for steak frites and local (and French) cheese selection.